Trying new recipes pulls us all out of the cooking rut. I was amazed at the delicious taste of this vegetarian alternative to the big, juice burger. Not only are the Portobello Pizza Burgers tasty, but SO incredibly easy. It’s perfect for summer grilling and it gives all your healthy eating friends a wonderful option. When I asked the question in my last Tasty Tuesday post, “What new foods have you tried lately?” I mentioned climbing into new cooking territories. 9 whole wheat rolls, toasted if desired. Combine Soup mix with olive oil in large Ziplock bag. Add mushrooms, turn to coat. Close bag and marinate in one hour. 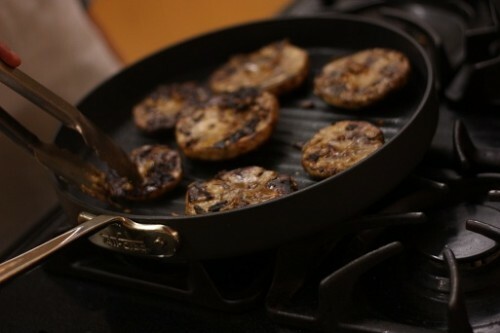 Grill or broil mushroom, turning once, 8 minutes or until tender, adding cheese during the last two minutes of cooking. Arrange mushrooms on buns, then top with Sauce.